At last! Effectively teach the alphabet and help your child build a strong reading and writing foundation. Are you tired of using incomplete teaching resources that show limited results? Does the thought of your student falling behind, worry you sick? Have you given up on finding a program that uses a common sense order to maximize your student's potential? Specifically - do you want your student to have a learning advantage built on effective communication skills while skipping the endless search for quality learning resources? If you answered "YES" to any of these questions, then take great comfort in knowing that you are NOT alone. IN FACT, parents and teachers everywhere are faced with the pressing need to find quality resources for their students that help increase effective early childhood development AND eliminate common alphabet learning mistakes. The TRUTH is - good educators are often unaware of the flawed alphabet teaching methods and materials that slow down a child's understanding and retention - HOWEVER you can now easily correct this. Yes! You can enjoy teaching the alphabet with confidence and give your student a strong reading and writing foundation. Watch your student effortlessly learn the alphabet with fun, clear and concise activities in as short as 10 minutes per session. Your student will learn how to learn, a vital skill in education that shapes lifelong habits and abilities. At this early stage, it is essential to focus on the development of the student's phonemic awareness - the ability to hear, identify and arrange phonemes (individual sounds), instead of routine memorization exercises. By training your student to identify individual letter sounds instead of the limited memorization techniques & exercises, you equip them to decode words along with their sounds even if they have not seen the words beforehand. This teaching method lays the strong foundation for learning any language and develops important universal communications skills. How can I get my student to develop these fundamental skills? That's exactly what the brand-new Learning the Alphabet Program is all about. This program equips you with necessary methods and materials to transform your student into a confident, skilled communicator and thinker. The activities, games, and worksheets are specifically designed to impart curiosity and a passion for learning while leading the way to learn the alphabet correctly. What essential skills and concepts will my student learn in the program? 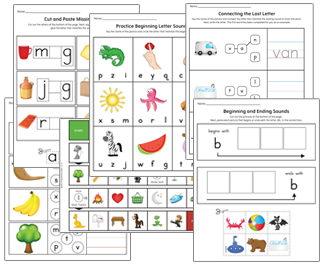 Develop correct letter sound recognition through connecting individual letters to their spoken sounds - phonics. Understand and recognize rhyming words. Confidently write letters in alphabetical order. 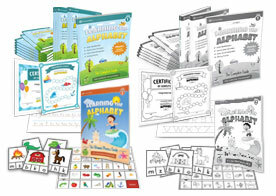 The Learning the Alphabet program is designed for children ready to begin learning the alphabet. In general, children between the ages of 3 to 6 years old who are in preschool or kindergarten. Having problems with letter reversals. Often disengaged, distracted or uninterested in learning. Confused or frustrated with the current learning materials. Intimidated by the idea of learning or lesson time. Mistake #1: Confusing graphics for children. "Hmmm, is that a hat or cap?" - "Is that a cat? It looks like a cat. Oh, it's a lion. On the previous page, they used the same picture for a tiger." The truth is, children are brilliant with association and memorization of images related to sounds. Avoid the confusion and utilize correct images to imprint consistent word relationships. Mistake #2: Flawed directions for letter formation. The real reason that many children fail to learn correct letter formation is because they lack proper direction from the start. Each time you teach letter formation using arrows and directions that promote incorrect positioning or the problematic ball-and-stick method, you reinforce possible letter reversal issues and difficulties. Mistake #3: Difficult font styles and improper font selections. Learning is challenging enough at times, why make it more difficult? Using difficult to read font styles will drain a student's attention and adds unnecessary mental work. For the best results, font styles need to clearly differentiate similar letters and provide a natural letter formation. Mistake #4: Confusing direction and instructions. The absolute best way of getting started is to have confidence in what you are teaching with clear instructions. How many times have you read a resource only to stop and scratch your head saying, "Hmmm, let me figure this out, what am I supposed to do next?" In every case, clear directions lead to clear action and learning. Mistake #5: Improper lesson progression. Nature provides the fundamental insight of crawl before you walk. The appropriate order and progression of skills and concepts are essential for children to learn, adapt and maximize their efforts. As an example, teaching the long vowel sound together with the short sound before students understand the rules for using each sound creates confusion and overwhelm. Students need sufficient activities and adequate practice in one area at a time to reinforce patterns and concepts to prevent materials from being forgotten. Mistake #7: No Answer Key. Teaching without a worksheet answer key can be time-consuming and frustrating. Teachers already have multiple tasks to accomplish during lessons, so having an answer key provides a fast and convenient way to check the student's work and help save on lesson time. Mistake #8: Lack of consistency. Consistency in activities, instructions, and concept introductions provide easy to understand and complete direction. Mistake #9: Incorrect word examples. An often overlooked mistake is to teach words that begin with a letter different from the correct beginning sound. As an example, using the words arm or airplane to teach the letter A sound, when in fact these words begin with a different phoneme sound. Mistake #10: Introducing advanced words prematurely. Teaching the letter X by using words like Xylophone, which does not use the most common sound of the letter, introduces the advanced sound before the student is ready. Starting with the most common sounds of each letter allow students to become comfortable and familiar before learning additional, advanced sounds. The Learning the Alphabet program was designed to address each item above to ensure you have the optimal teaching materials for your student – they deserve it. What is included in the Learning the Alphabet program? 26 complete workbooks specifically designed to help teach each letter of the alphabet - starting from the most basic concept of the letter shape to the introduction of the most common sound. Letter Identification - including uppercase and lowercase. Letter Formation - including uppercase and lowercase. Beginning Letter Sound - except for the letter X, which is discussed in the FAQs. A 367-page workbook that builds on the skills and concepts introduced in Level 1, providing a review to enable students to improve these skills and learn more advanced skills to set the ultimate pre-reading foundation. Fun and practical activities including puzzles, mazes and games. of practical tools and activities for maximum retention and a stress-free learning experience. And the best part, you can download the Learning the Alphabet program INSTANTLY! Yes, of course! 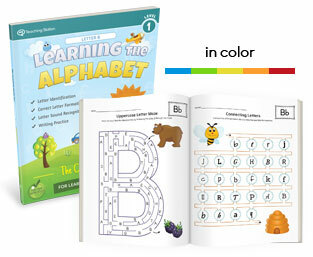 Download the complete Learning the Alphabet Level 1: Letter B Workbook as a FREE gift! Can I see a sample of the font used to teach each letter shape? 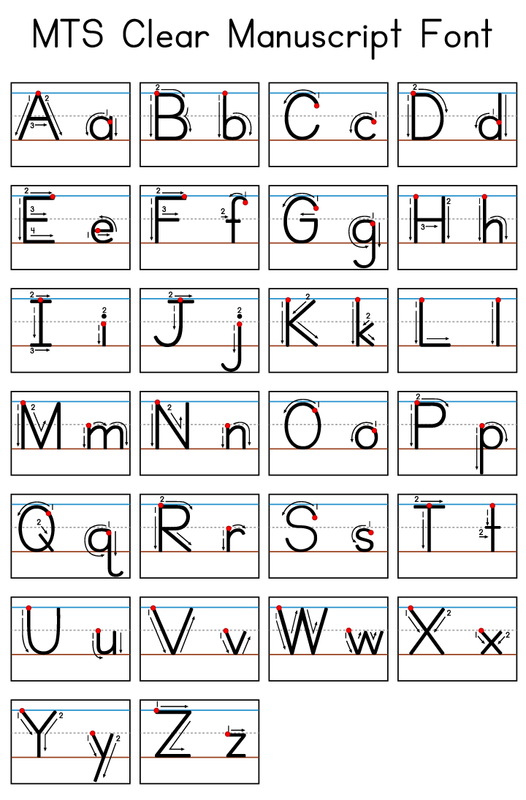 The Learning the Alphabet program uses the MTS Clear Manuscript Font. This handwriting style has been carefully designed to effectively teach emerging readers the most simplified version of each letter shape. Absolutely love this! Huge time saver and very well done. I use these worksheets in everyday instruction and activities for individual and small group lesson time. And the organization is spot on - thank you! I teach special education and this is such a huge addition to my curriculum. I love it!! It has so many great activities! I love these books, and the pace at which they give students to learn the alphabet. I love using these workbooks for my letter of the week program - what a life saver! They are tons of fun with super engaging activities that cover a wide variety of learning styles. The activities are easy to follow, and the font used to teach the letter shapes is perfect! Thank you. What a great value! Not only you will get INSTANT ACCESS to download the program, but we are also throwing in these four bonuses. Bonus #1: FREE updates for 3-Months 12-Months! 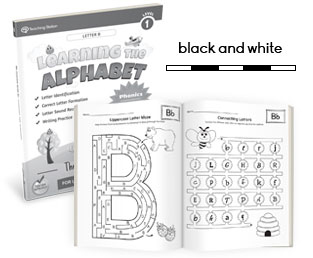 Download latest edition of the Learning the Alphabet program. A through Z uppercase and lowercase letter mat (digital download). 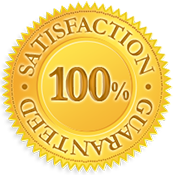 A "Program Completion" certificate to provide to your student. ** This product is a PDF Digital Download. Be sure that you have an application to open this file type. 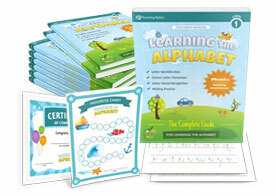 Looking to purchase the Learning the Alphabet Level 2 only or a Single Letter Workbook? If you are not satisfied with your purchase, let us know within the first 3 calendar days, and we will refund your payment in full. Quick and easy online refund - No questions asked. What method is used to teach letter formation? Letter formation is taught using the continuous stroke method versus the traditional ball-and-stick method. This method was selected to eliminate letter reversal problems and to prime students for learning cursive. For more information on letter formation, please see The Dangerous Truth About Continuous Stroke Versus Ball-and-Stick Handwriting Methods. Can I print copies of the book for different students? Small group or classrooms use: You may copy the program material for each student participating in a single classroom. Making copies for additional classes or school is prohibited. For multiple class use, please contact us for bulk licensing options. Home use: You may copy program material for use by multiple children within your immediate family. 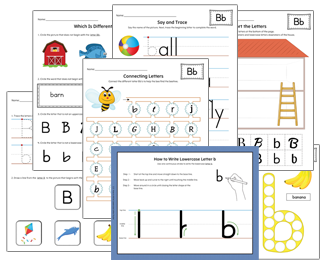 For more information, please see the Learning the Alphabet Level 1: Letter B workbook sample and My Teaching Station terms and conditions. Do the activities include the different letter sounds? No. Learning the Alphabet focuses on understanding the most common letter sounds while building phonemic awareness. The introduction of subsequent letter sounds including long vowel sounds is to be taught after the completion of this program. Rules for different letter sounds are best introduced once the student has a basic understanding of the letters and their common sound. Are harder concepts such as medial and ending sounds taught in the program? Children commonly learn sounds of letters at the beginning of a word more easily than in any other position. For this reason, the Learning the Alphabet Level 1 introduces the beginning letter sound first for each letter, except for the letter X (explained in the following FAQ). Medial and ending letter sounds are introduced in the Learning the Alphabet Level 2 once the child is familiar with the beginning letter sounds and given sufficient practice. Using this progression provides incremental growth and replaces the learning frustration of harder concepts with a more enjoyable and rewarding learning framework while maximizing your student's effort, capacity and retention. How is the letter X taught if the program does not use the beginning sound /z/ as in xylophone? The most common sound of the letter X is pronounced /ks/ as in the word box. Other sounds include /gz/ as in exam, /z/ as in xylophone, /g/ follow by /zh/ as in luxurious, /k/ follow by /sh/ as in complexion, /e/ follow by /ks/ as in x-ray. In the English language, few words begin with the letter X, and they commonly have the /z/ sound instead of /ks/ sound. For this reason, the letter X is taught using the ending sound position first. Additionally, it is reserved to be taught as the last letter in the Learning the Alphabet Level 1 program. To learn more about the letter X, see How to Teach the Letter X Sound. How does this impact your child's future? A student's learning experience is not a race; it's a lifetime journey. Of course, you believe your child will succeed and grow into their greatest potential while telling yourself, "They will eventually learn and become great readers and writers." But the truth is, a strong literacy foundation requires quality teaching materials. Most students turn out average because their learning materials are average. They focus on phonics and sight words while neglecting necessary concepts for truly learning how to read and write with confidence. If you are ready to accelerate your student's academic performance, click the button below and download the materials you need to get started.